A Developer Advocate for the Google Cloud Platform talks about new developments on the compute side of microservices and serverless. 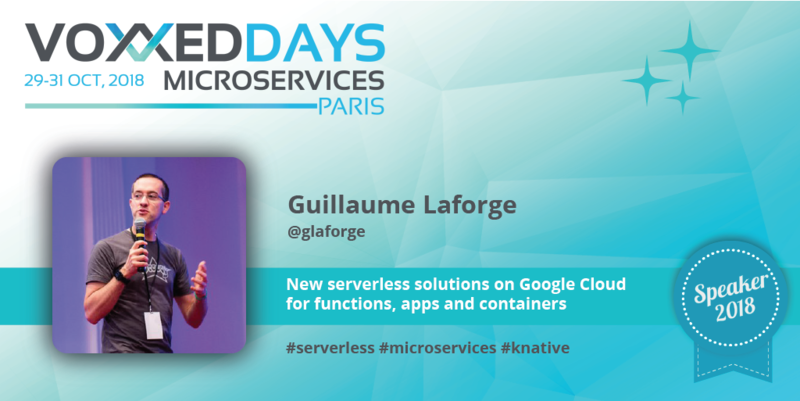 Hi Guillaume, tell us who you are and what lead you into microservices. I'm Guillaume Laforge, working as a Developer Advocate for Google Cloud Platform by day, and promoting the Apache Groovy language by night. I'm a Java Champion, and also one of the happy co-founders of the Cast Codeurs podcast (in French). As a Java and Groovy developer, I've always liked focusing on the ideas I wanted to implement, rather than spending days getting the right infrastructure in place beforehand. I was an early adopter of the Platform-as-a-Service approach since the early days of Google App Engine for Java, and microservices always appeared to me as a great way, and a great pattern, to have a more decoupled and cleaner architecture for my projects. Furthermore, in my career, I've often been involved with APIs (mainly REST, though) where intercommunication between services was an important aspect of the project architecture, so I'm also interested in microservices communication. Lots of things are happening in the realm of serverless, microservices, functions, containers, on Google Cloud Platform. It's interesting to see how functions, apps, containers tend to blend more and more these days. So I'd like to take a moment to cover all the latest news in this area. When you're building apps or APIs, the venerable App Engine provides new modern runtimes for various languages (Java, Python, Node...) on top of a new open source sandbox called gVisor. When developing smaller units of work, in the form of functions, Cloud Functions is the way to go, offering Node, Python and Go runtimes, with more coming soon. And if you have customized containers to run as microservices, there's also a new serverless container approach you can take advantage of. Beyond those platforms, there's also a new set of building blocks on top of Kubernetes: Knative (an open source project run by Google, Pivotal, Red Hat, SAP...) whose role is to let serverless framework developers build atop Kubernetes, so that developers can build and deploy portable microservices across cloud vendors or on premises, without any lock-in. So there's really lots of interesting things to cover on Google Cloud Platform, geared towards microservices development and deployment. You talk about "serverless" at a microservices conference, are these things related? Kubernetes, Istio, Knative... looks like Google is investing a lot in microservices, any other technology coming soon? Ah, ah, there's more coming soon, but I'm not allowed to reveal any secrets! But indeed, yes, it's really a super exciting time to be focusing on the "compute" side of things, as there are literally new interesting developments coming from every direction, around microservices and serverless. Google is touting the "serverless" buzzword a lot (well, like other cloud vendors!) but it's really been at the heart of what Google has been doing for 20 years internally with its internal data centers to run things like Gmail, YouTube, and other popular high-traffic services. To make systems more resilient and scalable for billions of users, the engineers have had to find ways to decouple and reuse services across the board, and that shows in all the recent products and platforms that have been made available to developers on Google Cloud Platform. I'm excited to join the line-up of super interesting speakers at the conference and learn about all the best practices, the lessons learned from the field, and see where the industry and where developers are going with microservices.